CI-Sign is our award-winning solution for client-side e-mail signatures. For over 5000 companies, CI-Sign is the first choice for managing corporate email signatures for Microsoft Outlook and OWA. CI-Sign is the email signature software solution for Microsoft Outlook 2016, 2010, 2007, 2003 and Outlook Web App (OWA). Centralize the management of email signatures for all users within your organization. With CI-Sign you create and deploy professional and Corporate Identity compliant email signatures in minutes. It gives you full control over the layout and distribution of email signatures. Client side (visible) signatures - distribution of email signatures directly to the user’s Outlook and Outlook Web App (OWA) client. The signatures are visible when composing or responding to an email. Central management - easily manage and deploy standardized email signatures for your entire company from one single spot. Custom rule deployment - Deploy email signatures to users based on Active Directory groups, organizational units (OUs), the user’s department or location or many other filters. Supports multiple Outlook profiles and email accounts - Set the right email signature for new messages and for forward and reply. Target specific or all of the user's Outlook profiles and email accounts. Multiple signatures - deploy multiple signatures to users to cover different roles or languages. Let users choose their signature as they type a message. Signature sharing - make user’s email signatures available to others for sending on-behalf-of. Auto-pilot deployment - Once set up, CI-Sign runs on auto-pilot. Changes in design, rebrands, new contact details will be rolled out centrally without any user interaction required. Your user’s email signatures will always be up-to-date. Test before you deploy - Built-in test center for testing and previewing email signatures and signature marketing campaigns for any selected user. Be sure that everything is fine before you deploy it. Remote working supported - You've got users working from outside the network, e.g. home office? No problem. The built-in "Web Service" feature deploys signatures to remote working users. No limits - build and manage as many email signatures and signature marketing campaigns as you like. CI-Sign has no limits. Real time statistics - Monitor the deployment of email signatures throughout the company. Identify and resolve any issues with signature deployment or generation. Delegate & save time - Simple rights management to control permission to template editor. Use it to delegate work and save time. First class support - rely on our lightning fast support via helpdesk, phone and email. Active Directory integration for 100% data accuracy - Pulls data from each user's Active Directory profile (alternatively SQL or Access Database) and populates it in email signatures, ensuring all user details are correct. Email signature marketing - customize email signatures by adding campaigns to promote awards, products, upcoming events, … Schedule and manage campaigns in advance and let CI-Sign take care of the rest. Unify your brand’s image - Enforce your corporate design on all emails. Easily set email fonts, formatting, themes and stationaries. You can even set font type and size for emails written in OWA and Office 365. Graphics support - Include logos, user photos, social media icons and any other graphics to your email signatures. Powerful designer - Quickly create signatures templates for HTML, RichText (RTF) and pure text emails using the built-in what-you-see-is-what-you-get (WSYIWYG) template editor. Power-user mode - switch between design and syntax highlighting HTML source code mode for detailed control of your templates. Additive or explicit deployment - deploy signatures in addition to the user's own email signatures; or block and remove own signatures. Super simple implementation - No installation required, no task running in the background, no client-side administrator permissions needed. Download, unzip and configure CI-Sign. Use a GPO or login script to deploy it in your corporate network. It's as easy as that. No mumbo-jumbo, just software that works. Time saving - the on-going deployment and administration is easy. It simplifies what is an onerous task without CI-Sign and saves you a whole lot of time. Ready to use templates - We offer a wide variety of professional templates to get you started. Scalable - CI-Sign is used by companies with just a few users to big corporations with thousands of employees. As CI-Sign runs on the client side the workload is spread and you will never encounter any performance issues. Internationality - Works with all languages and character sets due to fully Unicode compliant implementation. Smartphone ready - extend the power of CI-Sign to mobile phones, tablets and Macs with our award-winning software CI-Mail-Policy or by using one of our mobile signatures apps. 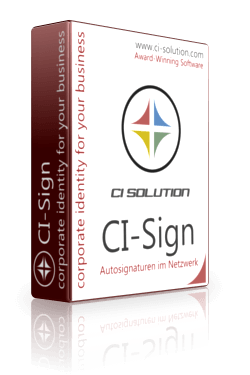 CI-Sign is licensed on a per user basis. The table below shows the price per user/license. When purchasing new licenses a one year Service Maintenance Plan (SMP) is included. After expiration you are free to extend the SMP to 15 % of the license price per year; see column "SMP extension". Bundle* price: Purchasing either CI-Sign or CI-Mail-Policy entitles you to buy the other product at half price. Trial software is fully functional for one month. To use the software after this period, you must purchase a license. If you need more time for testing, send us an email and we will gladly extend your trial period. Installing this software will not affect your system, browser or any security settings without the user's consent. Choose this download to get started with CI-Sign. Already using CI-Sign? Choose this to update CI-Sign to the latest version. Alternative: Choose "Internet Update" from within CI-Manager to automatically update the software.